How to get through the new dog intake process as easily and as quickly as possible. Make contact with Kendra at Sit Stay Sleep. Call 510-527-1011 or email to: info@sitstaysleep.com or better yet, just use our contact form. Complete one intake questionnaire for each dog. SSS will confirm receipt of your form by email. Schedule an intake interview and visit to Sit Stay Sleep for you and your dog, bring your completed intake questionnaire. This visit generally lasts about 30 minutes. At this meeting you will review your completed Sit Stay Sleep intake questionnaire with Kendra and have an opportunity to discuss questions and concerns. Kendra will give you the address to her home prior to your visit. Schedule a trial stay for your dog at SSS. If your dogs first boarding stay will be less than 3 nights they will need to come for a day of daycare to assure they will fit in with our pack. 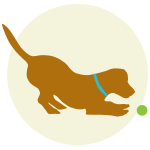 If your dog’s first boarding stay will be longer than 3-nights I do require a trial overnight stay. It really does help both the dog and I know that they will be happy here. The first two forms Kendra will send you as PDF files by email for you to print out, sign, and return via email or drop by. The Travel Itinerary can be filled out online. SSS will confirm receipt of that form data. Schedule dates via email for your dog’s stay at SSS. You will receive an email with your invoice prior to your dog’s stay, once SSS has received your travel itinerary. Payment is required at drop-off. More info on Rates.